Aki Scarf pattern by Amy PickardThis simple scarf is knitted on the bias, with rows of eyelets. It’s a great pattern for beginners to try out their lace knitting skills. Free til May 1, 2014, no code needed. Simply click ‘Buy it Now’, then click ‘add a coupon code’ and it will auto-deduct. Bitchin’ Knit Lace Wrap pattern by Jenny FlameI lost my job, and while I’m searching for a new one, this pattern will be free until May 1st! 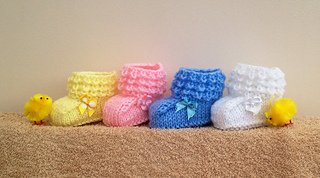 Crocodilly Mocs for Newborns pattern by Kris Basta – Kriskrafter, LLCI love the crochet crocodile stitch and I wish it could be replicated exactly in knitting. This crocodile stitch isn’t quite as heavy in the texture but still has a great crocodile look. Love the crocodile stitch look? Want some for yourself and not just for baby? You’re in luck! 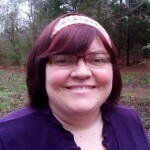 Kris Basta has generously provided us with this awesome looking pattern free on Ravelry. Continuing with the croc look, we have found this cute little crocheted owl pattern, newly free on Ravelry also. Crocahoot pattern by Anne RutgrinkA cute little owl whose feathers are made using the Crocodile stitch by Yarn Muse. 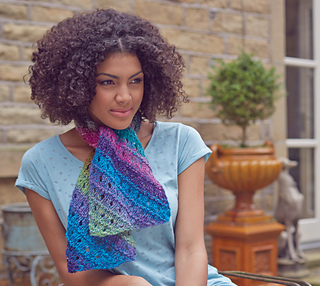 Also newly free this week on Ravelry is this lovely triangle shawl pattern. I am going to have to put this one on my queue! A Piece of Cake Shawl pattern by Magdalena RoslaniecYou need one skein of each yarn – Alize Angora for the main body and Kid Mohair for the lace border. Usually by now, here where I live it is much warmer.. this year it has been quite rainy and cool. These mittens surely fit the part! 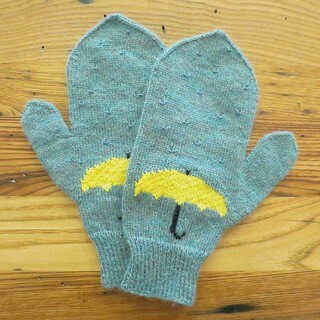 April Showers Mittens pattern by Kat LewinskiBeaded raindrops fall on a cheery, yellow umbrella on these April Showers Mittens. 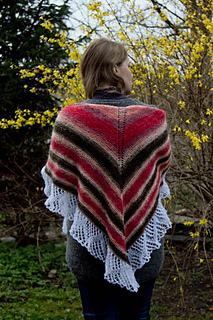 Here is a new shawl pattern, just released this month, and free! Meadow Grass pattern by Heidi AlanderMeadow Grass is a simple shawl with stripes and easy lace edging. The size is adjustable – you can make the edging as long as you wish. Interesting texture on this one! Also free. Mossie pattern by Brian smithThis top down shawl uses two strands of a 4ply yarn to create texture. Reverse stocking stitch, is matched with stocking stitch where stitches are knitted into the back, to give them a raised appearance. Lace eyelets define sections.